Because of North Korea’s dependence on China, it makes sense that Pyongyang would consult with Beijing before any major approach to the West. North Korea’s Korean Central News Agency said the two leaders “deeply” exchanged opinions on mutual relations and the security environment. 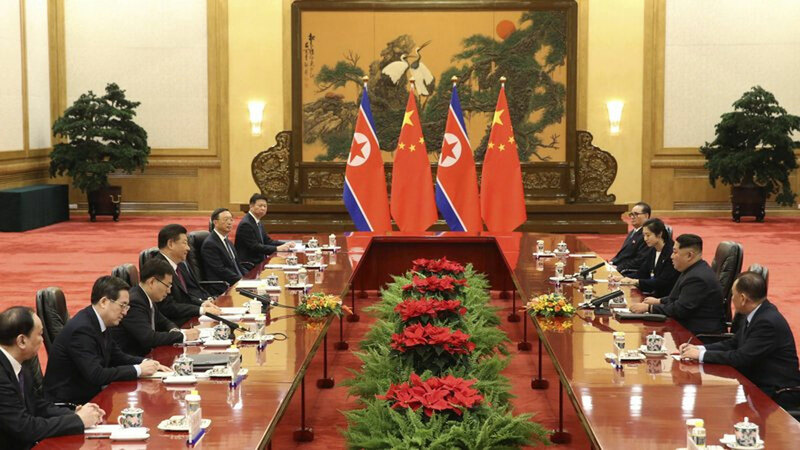 North Korean leader Kim Jong Un’s surprise visit to Beijing makes clear what has been easily forgotten amid the whirlwind of diplomatic developments in past months: China still plays a major role in efforts to end North Korea’s nuclear program. Just how much is still open to debate, but the visit shows Kim Jong Un hasn’t forgotten his only major ally despite recent antipathy between the countries and bombshell announcements that the young North Korean leader will hold summits with his foes in Washington and Seoul. China, after all, provides the vital trade, aid and diplomatic support that keep the North and its broken economy afloat. Because of North Korea’s dependence on China, it makes sense that Pyongyang would consult with Beijing before any major approach to the West. Analysts say Kim, on his first visit overseas since taking power since 2011, would have intended to remove any Chinese concern that it’s being reduced to a bystander as Pyongyang attempts to shake up regional politics by reaching out to Seoul and Washington. In demonstrating its ties with China, North Korea could also a message to Washington and Seoul, showing it has other options should the summits fall apart. Other experts say it’s also possible that the Kim-Xi meeting would have been planned long before Kim’s outreach to South Korea and the United States. Kim Dong-yub, an analyst from Seoul’s Institute for Far Eastern Studies, said the summit was a predictable outcome between two leaders who believe they have completed consolidating their power at home and are now shifting their focus to external stability. “So what’s next for Kim Jong Un — Russia?” said Kim, the analyst. North Korea’s Korean Central News Agency said the two leaders “deeply” exchanged opinions on mutual relations and the security environment on the Korean Peninsula. The agency said without specifying that Kim called for stronger “strategic communication” and “strategic, tactical cooperation” to bolster unity and cooperation between the traditional allies and take relations to the next step. “It’s most proper that my first overseas trip would be the capital of the People’s Republic of China as it’s also one of my noble duties to value the North Korea-China friendship as I do my own life and extended it (for another generation),” said Kim during a banquet hosted by Xi, according to the agency. Kim was accompanied by his wife Ri Sol Ju and many senior North Korean officials, including Foreign Minister Ri Yong Ho and senior ruling party officials Choe Ryong Hae, Ri Su Yong and Kim Yong Chol. It may also be that the North recognizes some hard realities. North Korea’s diplomatic outreach to South Korea and the United States followed an unusually provocative year of weapons tests and has been seen as an attempt, in part, to improve a struggling economy crushed the heavy sanctions those tests brought about. North Korea’s provocations also took a toll on relations with Beijing. Despite their decades-long alliance, forged during the 1950-53 Korean War, China has played a crucial role in international pressure against North Korea over its nuclear program and has signed on to increasingly strict U.N. sanctions. China’s strengthened actions in recent months — including restrictions on oil supply — may have significantly raised North Korea’s need to seek a diplomatic breakthrough. For Beijing, it wants to be seen as a custodian of peace and stability in the region and also a larger player in world diplomacy as it competes with the United States for influence in Asia. But it also has its own interests in mind. China is unhappy about having an emerging nuclear menace at its doorstep, but also doesn’t want to see a collapse of a next door government it sees as a buffer state against U.S. ally South Korea. China has long advocated for a restoration of dialogue along the lines of the six-nation talks involving itself, North Korea, the United States, South Korea, Japan and Russia, accompanied by a pause in U.S.-South Korean war games and the North’s suspension of nuclear and missile activities. If the North’s talks with South Korea and the United States fall apart, Pyongyang could move to demonstrate its nuclear weapons and missile capabilities again. Du Hyeogn Cha, a visiting scholar at Seoul’s Asan Institute for Policy Studies, said in that case it’s likely that North Korea would seek China’s commitment for future support, or at least a promise it won’t hit the country too hard with more sanctions should it resume weapons tests.